Ted Kazanski (not to be confused with Kaczynski) didn’t have a stellar career in the majors. In his six-year career, all of which was spent as a Phillie, the utility infielder batted .217 with a total of 118 runs, 116 RBI, and 14 HR. 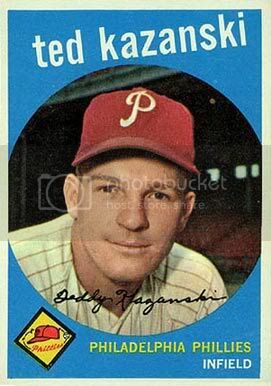 But on August 8, 1956, Kazanski made a mark that no Phillie has since matched. 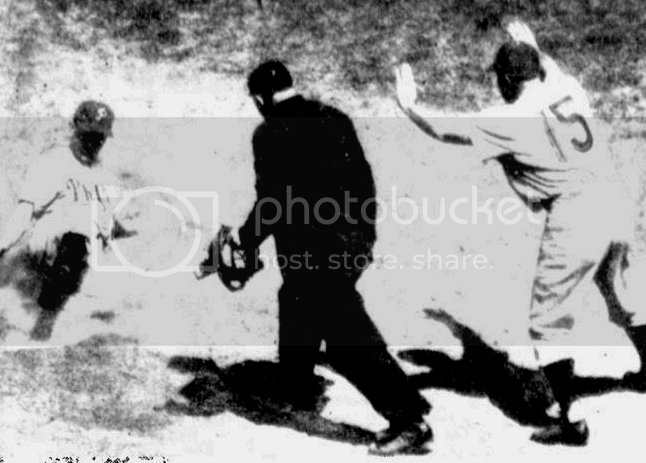 On this date 55 years ago, the Phillies were facing the New York Giants at Polo Grounds. The Phils were up 3-2 heading into the top of the 6th inning. Giants pitcher Jim Hearn, coaxed a leadoff ground out from Del Ennis and then gave up consecutive singles to Elmer Valo and Willie Jones. After Granny Hamner was intentionally walked, second baseman Ted Kazanski stepped to the plate with the based loaded and one out. Kazanski smoked a liner to the center field wall, which stood 483′ from home plate. Even with Willie Mays sprinting to the ball, the fact that Polo Grounds boasted the deepest center field wall of any stadium in major league history gave Kazanski all the time he needed to round the bases and score. Kazanski was the 4th, and last, Phillie to hit an inside-the-park granny. The others were Irish Meusel (1918), George Harper (1924) and interestingly one of the guys who crossed the plate before Kazanski: Willie Jones (1951). Five Philadelphia Athletics accomplished the rare feat, two of whom did it twice: Harry Davis (1902 and 1904), Danny Murphy (1904 and 1908), Stuffy McInnis (1911), Lee Gooch (1917) and Ferris Fain (1947). I saw Ted Kazanski’s inside the park grandslam home run when I was a teenager. I lived in Lansford PA and saw it on WPIX NY. Ted was my favorite Phillie because he played Shortstop and was of Polish decent both of which I was. It was a sad when Willie Jones and Granny Hamner would return to the lineup and Ted had to sit. What was even worse is when he got traded to Milwaukee. I just played golf with Ted last Saturday and he recounted the story of his inside the park Grand Slam after Tiger James McCann hit his this past week.